Employees at Connect U, a professional development conference for UVic staff, where employees get to build skills, learn more about the university, network with colleagues and have fun! At UVic, we are deeply committed to contributing to a better future for people, places and the planet. We aspire to be the Canadian university that best integrates outstanding scholarship, inspired teaching and real-life involvement. People and place provide the foundation upon which we will continue to build an extraordinary environment for the creation, dissemination and mobilization of knowledge. Our beautiful Pacific coast location, inclusive and collegial culture, the influence of Indigenous and international perspectives, and our dedication to the highest standards of teaching, research and creative activity, and service make UVic the place where people want to learn, work, engage and discover. UVic is committed to fostering environments for work and study that are safe, supportive, inclusive and healthy, encourage mutual respect and civility, while recognizing that people are our primary strength. The University of Victoria actively promotes and communicates coordinated practices of inclusion, respect, wellness, accessibility, safety and accommodation as the foundations of a healthy campus community. We take a holistic approach to workplace health and wellness and define well-being as a concept that includes physical, intellectual, spiritual, social, occupational, financial, environmental and emotional health. UVic is committed to taking the necessary steps to encourage healthy living and supportive return-to-work processes by building robust programs that train and support our employees. Living and working in one of the world’s most environmentally rich regions inspires us to learn from its stories and safeguard its integrity. Sustainability is a key driver in all of our business decisions and is part of curriculum in nearly every major field at UVic, from science and engineering to social sciences and law. Across the board, UVic research is at the forefront of sustainability breakthroughs for our changing world. We’re a global leader in both climate and ocean sciences and sustainable energy research. UVic was also selected to host and lead the Pacific Institute for Climate Solutions (PICS), a province-wide hub for internationally leading climate change research. Our campus operations also reflect our focus on sustainability. All of our new buildings are constructed to meet the LEED Gold standard, one of the highest green building ratings in the world. Most are situated on former parking lots to preserve our natural spaces. Valuable initiatives across campus—from strategic purchasing and transportation initiatives, to student-led proposals and changes in teaching curriculum—have further embraced sustainability in ways that bring both tangible results and an increased level of cultural know-how that continues to help us improve both individually and institutionally. These initiatives and others have contributed to UVic being recognized as one of Canada’s Greenest Employers. Here at UVic, we strive to be a diverse, welcoming learning community, with a demonstrated commitment to equity and fairness. Everyone at UVic has a role in promoting a welcoming and inclusive campus. This includes actively promoting and communicating coordinated practices of inclusion, respect, wellness, accessibility, safety, and accommodation as the foundations of a healthy university community. A number of campus offices support this work, including Human Resources and the Equity and Human Rights Office. Read UVic’s equity statement and find related resources about our commitment to equity, diversity and inclusion. An important part of being successful at the University of Victoria is developing your career. There are a number of opportunities to learn more about you, the work we do here at UVic, and about career growth options. Our just-right size and collaborative structure nurture rich personal connections on campus and have created a dynamic community. You will find a number of opportunities to attend lectures, learn about new research and engage with our local communities. Read more about this in our community news source, The Ring. Student Enrolment - 21,593 (including 3,446 graduate students); 53% female. More than 70% of undergraduates come from outside Greater Victoria. (2015/16 academic year). Faculty and Staff - 4,851 employees, including 879 faculty (43% female, 57% male); 524 sessional instructors; 1,088 specialist/instructional staff; and 2,360 administrative, professional and support staff (Feb. 2016). Alumni - 116,367 alumni by degree, certificate or diploma. Among 97,584 living, contactable alumni, more than 79% live in British Columbia and 5,395 live in 137 other countries. More than 38,000 live in Greater Victoria. One in eight adults in Greater Victoria holds a UVic degree (Nov. 2015). We offer over 76 degree programs in 11 faculties and divisions and 40 schools and departments. UVic is also home to over 20 cutting-edge research centres and institutes. Get more UVic facts and figures. Nestled between the ocean and the forest with stunning mountain views, UVic enjoys an enviable location. Our campus is located on 402 acres of beautiful, park-like property, just 15 minutes from downtown Victoria and within walking distance of the Pacific Ocean, as well as many shops and restaurants. Excellent students are attracted to UVic by the engaging faculty, relatively small class sizes, intimate community atmosphere and the many experiential learning opportunities. Seventy per cent of our students come from outside of Victoria, making UVic a destination university full of people living away from home and invested in creating a community together. The co-operative education program, one of the largest and most diverse in Canada, provides students with relevant, engaging and practical learning experiences beyond the classroom. For a closer look at the campus take our virtual tour. See current job postings for staff positions. All staff postings at the University of Victoria are posted through our online job management system - UVic Careers. Please view our video tutorial for a system overview. Log in to UVic Careers. If you do not have a UVic netlink ID and this is your first time using this system, you will need to create a new login ID. Search Jobs from the Career Centre. If you see a position that interests you, select the job title to view the job details. Select the Submit your Resumé/CV to this Job button at the bottom of the page. Complete your application. The system saves a plain version of your resumé for easy previewing. It also saves your resumé in PDF format. The original formatting is viewable by the selection committee. Review your application on the Preview screen. It will appear in plain text. However, your formatted resumé will be viewable by the selection committee. Use the edit icon to make changes. When you are satisfied with your application, choose the Finish button to submit your application. You will receive a message that you have successfully completed the application process. More details are available in our Browse and apply for opportunities quick guide and searching and applying for jobs video tutorial. Access more resources and details on how to use UVic Careers. The application - Apply online with UVic’s online job management system - UVic Careers. You'll need to submit an application cover letter, resume and the names of three references. Closing date and time - CUPE positions are posted on our site, normally for seven calendar days. Positions are also posted outside the Human Resources office in the Sedgewick Building, Vandekerkhove Wing. All competitions close at 4:00 p.m. on the closing date. Late submissions will not be accepted. Internal-only postings - Only CUPE 951, 917 and Exempt Support employees may apply for internal-only postings. If you're a casual (on-call) CUPE employee you may apply as an internal applicant if you've worked in a CUPE 951 or 917 position within the previous 20 working days. The selection process - Human Resources reviews the applications, then forwards them to the hiring department for shortlisting, interviewing, and selection. This process normally takes a week to ten days. The selection criteria for CUPE competitions are seniority, work performance and pertinent qualifications. The university has a small number of secretarial and clerical positions which are exempt from union membership under the provisions of the Labour Relations Code. How to apply - Apply online with UVic’s online job management system - UVic Careers before 4:00 p.m. on the closing date. You'll need to submit an application cover letter, resume and the names of three references. Administrative and academic professional (PEA) positions are usually posted for a minimum of two weeks. Late applications may be considered at the discretion of hiring department. The selection process - After the closing date, Human Resources reviews and forwards all applications to the hiring department for shortlisting and interviewing. This process normally takes at least two weeks. Most teaching and research support positions (specialist/instructional) are temporary, coinciding with the academic term. These positions are usually filled by graduate and undergraduate students recruited directly by individual departments. Note: These are general descriptions of the university's employee groups. Contact Human Resources if you have questions. The numbers for each group represent approximate head counts as of March 1, 2012. CUPE 951 is made up of approximately 693 regular and 90 term office, technical, and child care employees. CUPE 917 is made up of approximately 333 full-time and 108 part-time employees. They work in areas like maintenance and grounds, food and housing services, athletics and recreation, campus security and university auditorium. CUPE 4163 is the University of Victoria Educational Employees' Union. CUPE local 4163 is made up of approximately 1500 members. It represents teaching assistants, second language instructors, sessional lecturers, lab instructors, computing user services employees, music performance instructors, academic assistants, cultural assistants and others. Component one is made up mostly of graduate and undergraduate employees who work as teaching assistants, lab instructors, computer lab assistants, cultural assistants and academic assistants. Component two is made up of second language instructors in the English Language Centre and French language program. Component three is made up of music performance instructors and sessional lecturers, who teach the bulk of undergraduate courses at UVic. Professional Employees Association (PEA) is comprised of approximately 774 full-time and 78 part-time administrative and academic professional employees. Management excluded group - 92 senior management employees are excluded from a bargaining unit. They are governed by a terms and conditions document which is available through Human Resources. Exempt group - 32 employees are excluded from the bargaining unit. Terms and conditions documents applying to this group are available through Human Resources. University of Victoria Faculty Association is made up of approximately 886 faculty members and 40 professional librarians. Please see the faculty framework agreement. The University of Victoria is one of Victoria's largest employers. UVic was chosen as one of Canada's Best Diversity Employers and Greenest Employers. Learn more about our rankings. With over 2,000 employees, there's a wide range of jobs on campus. We're office workers, horticulturalists, physicians, technicians, graphic designers, library assistants and more. 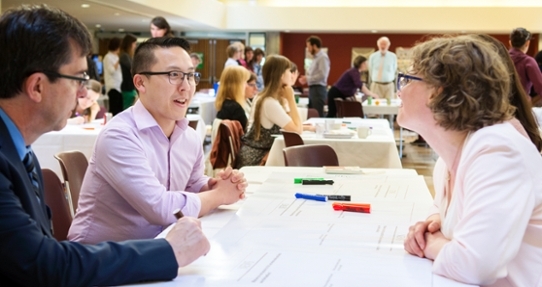 See current opportunities for faculty and librarians at UVic.